Thomas Richard Bolin was born on 1st August 1951 in Sioux City Iowa. His father Richard was of Scandinavian descent and his mother Barbara was of Syrian. Tommy’s early interest in music centered around the sight of Elvis Presley on the Caravan of Stars television show, followed by Richard taking some of the family to see an Elvis performance when Tommy was five years old. That same year Tommy learned to pantomime to “Heartbreak Hotel” and appeared on “Kids Corner” (a local TV talent show) wearing a full Elvis costume. The station was impressed and asked him back three days later. He also came in second at a talent show at Lake Okoboji, after which his obsession with rock and roll began. Tommy’s first band was called the Miserlous, but he was quickly heard by members of Denny & The Triumphs, an experienced group of teenagers organized by George Larvick, Sr., father of band members Brad and George Jr. Tommy was invited to jam, and soon joined the group. Not long after, bassist Denny Foote was sacked, and the band changed it’s name to Patch of Blue with George Jr. taking over Denny’s bass spot. Patch of Blue lasted until mid-1967. He was meeting many musicians and club owners, but nothing was sticking together until his first late-night encounter in a blizzard with the members of what would become American Standard, and whose singer, Jeff Cook, would be associated with Tommy as a singer and later a lyricist for the rest of his life. By the end of the '60s, Bolin found himself in the blues-rock outfit Zephyr, led by Candy Givens. After a pair of albums that failed to attract a large audience, 1969's self-titled debut and 1971's "Going Back to Colorado", Bolin left Zephyr. Interested in the burgeoning jazz fusion scene, Bolin formed a similarly styled outfit, Energy. But apart from live shows and demos, Energy failed to secure a recording contract. Drummer Billy Cobham invited the young guitarist to play on his solo debut, Spectrum. Issued in 1973, the album became an instant fusion classic, as Bolin's fiery guitar work lit up such tracks as the over-the-top "Quadrant Four," "Stratus," and "Red Baron." Bolin was hired by the James Gang to get their career back on track, after founding guitarist Joe Walsh had left the group in 1971, the remaining members had seen their fortunes slowly fade. And while Bolin's arrival didn't return the group back to the top of the charts, a pair of quite underrated albums were issued, 1973's "Bang" and 1974's "Miami", as the guitarist also sang lead for the first time on record. In the start of 1975, Bolin contributed some studio guitar assistance to Canadian band Moxy during the recording of their debut album. Later in 1975 saw the release of Bolin's first solo record, "Teaser". After Ritchie Blackmore left Deep Purple, the band had a meeting and discussed whether to disband or try and find a replacement, and chose the second option. David Coverdale had been listening to the Billy Cobham LP Spectrum. He decided he wanted Tommy in Deep Purple, and invited him over for a jam. Tommy showed up with his girlfriend in tow wearing a see through mesh mini-skirt. He plugged into 4 Marshall amps and jammed with the band for 4 hours. The job was his. The band then relocated to Munich, Germany, to begin work on "Come Taste the Band". Bolin wrote or co-wrote seven of the record's nine tracks, including the instrumental "Owed to G," which was a tribute to George Gershwin. "Come Taste the Band" was released in late 1975, and Australian, US and Japanese tours ensued. 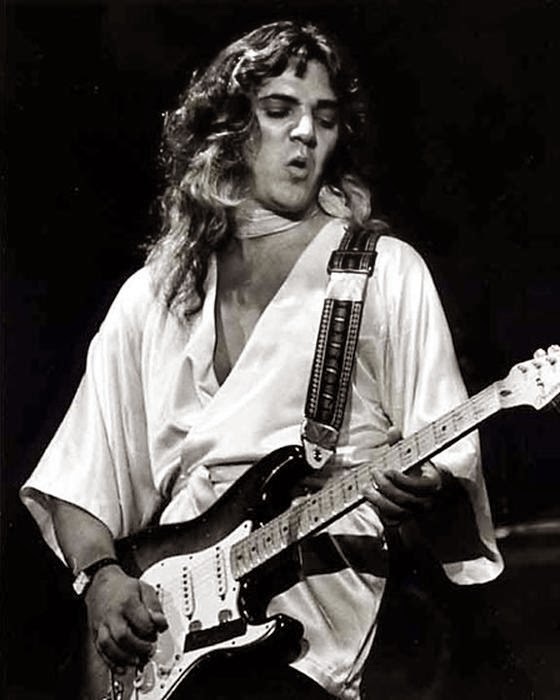 After Deep Purple disbanded in March 1976, Bolin was back on the road with his solo band with plans for a second solo record. By mid-1976, CBS signed Bolin and he began to record "Private Eyes", his second and last solo record. Sadly, Bolin was found dead from a heroin overdose on December 4, 1976, in Miami, FL (the day after opening a show for Jeff Beck), at the age of 25.